Photo studio light head with reflector is an ideal equipment for side, accent, or background lighting. It works on 110 - 130V standard outlets and has a long cord with built in ON/OFF switch. Light head works well with table top photo tent, photo softbox cube as well as photo studio lighting. It eliminates glares and produces shadow less images to show the true color of an object. Height adjustable light stand is suitable for professional photo or video studio. 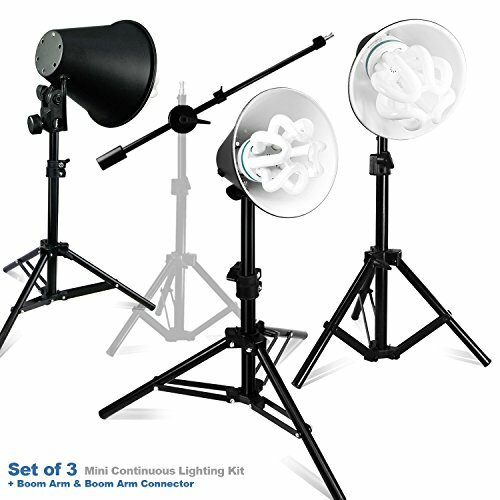 Light stand can be attached to any kind of flash light, continuous light, and strobe light with Standard ¼ inch thread. Solid locking system makes the light stand more stable and sturdy.